Definition: Let be a geodesic space and . For convenience, let be the only (up to isometry) simply connected Riemannian surface of constant curvature and let denote its diameter; therefore, is just the hyperbolic plane , the euclidean plane or the sphere with a rescaling metric and is finite only if . We say that is a space if every geodesic triangle of diameter at most satisfies inequality, and that is of curvature at most if it is locally . This definition of curvature bounded above is good enough to agree with sectional curvature of Riemannian manifolds: A Riemannian manifold is of curvature at most if and only if its sectional curvature is bounded above by . For more information, see Bridson and Haefliger’s book, Metric spaces of nonpositive curvature, theorem I.1.A6. Definition: A group acts geometrically on a metric space whenever the action is properly discontinuous and cocompact. Such actions are fundamental in geometric group theory, notably because of Milnor-Svarc theorem: if a group acts geometrically on a metric space , then is finitely-generated and there exists a quasi-isometry between and . See [BH, proposition I.8.19]. Let us say that a group is if it acts geometrically on some space. Notice that, if is a space, then is a space. Therefore, a group is either or or . Theorem: Any finitely-presented group is . Sketch of proof. Let be a finitely-presented group. If is a Cayley complex of , it is know that the natural action is geometric – see Lyndon and Schupp’s book, Combinatorial group theory, section III.4. Now, the barycentric subdivision of is a flag complex of dimension two. According to Berestovskii’s theorem mentionned in [BH, theorem II.5.18], the right-angled spherical complex associated to is a (complete) space. Of course, the action is again geometric, since the underlying CW complex is just . Theorem: Any group is the fundamental group of a space . Moreover, if is finitely-presented, can be supposed compact. Sketch of proof. Let be the CW complex associated to a presentation of ; then and is compact if the presentation were finite – see Lyndon and Schupp’s book, Combinatorial group theory, section III.4. As above, the right-angled spherical complex associated to the barycentric subdivision of is a space, and its fundamental group is again isomorphic to , since the underlying CW complex is just . On the other hand, many properties are known for groups; the usual reference on the subjet is Bridson and Haefliger’s book, Metric spaces of nonpositive curvature. Furthermore, is not difficult to prove that groups are Gromov-hyperbolic. However, it is an open question to know whether or not hyperbolic groups are , or even . Let us conclude this note by noticing that, for a fixed space , it is possible that only few groups are able to act on it. For example, we proved in our previous note Brouwer’s Topological Degree (IV): Jordan Curve Theorem that, for any even number , and are the only groups acting freely by homeomorphisms on the -dimensional sphere . Theorem: Let be three finite groups. If then . Therefore, there exists a monomorphism from to . From , we deduce that and have the same cardinality, so we conclude that and are in fact isomorphic. Because a classification of finitely-generated abelian groups or of divisible groups is known, it is easy to verify that cancellation property holds also for such groups (the classification of divisible groups was mentionned in a previous note). However, in his book Infinite abelian groups, Kaplansky mentions that the problem is still open for the class of all abelian groups. We conclude our note by an example where the cancellation property does not hold even if the groups are all finitely-presented. So . To conclude, it is sufficient to prove that and are not isomorphic. Notice that they are both a semi-direct product . hence or . Therefore, has to divide and we deduce that . We conclude that cannot be an isomorphism. where and , but and are not isomorphic. Corollary: is not a cancellation group. Theorem: The additive groups , , and are all isomorphic. gives an isomorphism , we conclude the proof. Nevertheless, the converse of our criterium does not hold, that is there exist two non-isomorphic vector spaces such that the associated groups are isomorphic: and give such an example as -vector spaces. In particular, it is worth noticing that the choice of the field is crucial. Nota Bene: In this note, we used the axiom of choice dramatically, assuming that every vector space has a basis. In fact, the axiom of choice turns out to be necessary at least to prove the isomorphism , as noticed by C.J. Ash in his article A consequence of the axiom of choice, J. Austral. Math. Soc. 19 (series A) 1975 (pp. 306-308). More precisely, the author shows that the isomorphism implies the existence of a set of reals not Lebesgue measurable, concluding thanks to a model for ZF due to Solovay in which every subset of reals is Lebesgue measurable. Theorem 1: Let be a finite group. If then is abelian. Theorem 2: Let be a finite group. If then is nilpotent. Indeed, if is non-abelian then , and the upper degree equation bound implies ; therefore, theorem 1 is proved. Then, if then the upper degree equation bound implies . If , is abelian and there is nothing to prove. Otherwise, ie. for some . For all , , so either or which implies ; therefore, . We proved that , so ; in particular is nilpotent. Lemma 1: Let be a finite group. Then where denotes the number of conjugacy classes of . Therefore, computing is equivalent to computing and . But we know that the number of conjugacy classes is quite related to representation theory, and indeed we will prove Theorem 3 thanks to representation theory. Definitions: Let be a finite group. A (complex) representation is a morphism for some complex vector space (of finite dimension); the degree of the representation is the dimension of . By extension, we often say that is a representation. Any finite group admits a representation. For example, if denotes the complex vector space with as a basis, the left multiplication extends to a representation, namely the regular representation of . If is a representation, a subrepresentation is a subspace stable under the action of . A representation is irreducible if it does not contain a nontrivial subrepresentation (ie. different from itself and ). If are two representations, we define the direct sum as the representation defined by the action for all , and . Two representations and are isomorphic if there exists a -invariant isomorphism . Property 1: (Maschke) Any representation is a direct sum of irreducible representations. Therefore, because is stable under , the orthogonal for so is, and . Finally, Property 1 follows by induction on the dimension of . Of course, in the decomposition given by Property 1, the same representation may appear several times (up to isomorphism). Thanks to a theorem due to Frobenius, this number may be characterized. Clearly, the dimension of is , the number of conjugacy classes of (a basis of is given by the set of functions taking the value on a fixed conjugacy class and otherwise). Associated to a representation , we define a character defined by . A character is said irreducible if the associated representation so is. Property 2: (Frobenius) Let be a finite group. The set of irreducible characters defines an orthonormal basis of . Proof. We first prove that the family of irreducible characters is orthonormal. Of course, two isomorphic representations are conjugated, so their characters are equal; therefore, it is sufficient to prove that two irreducible representations satisfy if and are isomorphic and otherwise. We define the representation as the representation defined by the action for every , and . Now, let denote the set of fixed points of the action of on . Claim 1: (Schur) if and are isomorphic, and otherwise. A nontrivial element of defines a -invariant isomorphism , hence if and are not isomorphic. From now on, suppose that and are isomorphic, and let be a -invariant isomorphism. Let . Then . Let be an eigenvalue of , so that is not invertible. Notice that is a subrepresentation of , so because is irreducible and is not invertible. We deduce that that is . We just proved that is one-dimensional. Claim 2: For any representation , where denotes the set of fixed points. Finally, from Claim 1 and Claim 2, we deduce that the family of irreducible characters is orthonormal. Now, if denotes the subspace of spanning by the irreducible characters, we want to prove that or equivalently that . So let . We want to prove that, for any representation , the function is zero. According to Property 1, is a direct sum of irreducible representations ; in particular, . Therefore, we may suppose without loss of generality that is irreducible. hence . We just prove that , so . Proof. According to Property 1, may be written as a direct sum of , say . Then because . But we saw during the proof of Property 2 that if and are isomorphic and otherwise. Therefore, is the number of representations in the decomposition isomorphic to . So Property 3 follows. Corollary 4: Let be a finite group. The number of conjugacy classes is equal to the number of irreducible representations up to isomorphism. Proof. We already noticed that isomorphic representations lead to equal characters. Conversely, Property 3 implies that two representations with the same character are isomorphic. Therefore, is equal to the dimension of , is equal to the number of irreducible characters according to Property 2, and now the number of irreducible characters is equal to the number of irreducible representations. Corollary 5: Let be a finite group. Then where the sum is taken over the set of irreducible representations up to isomorphism. Proof of Theorem 3. Let denote the irreducible representations of up to isomorphism. Representations of degree 1 are only morphisms from to , so the number of such representations is equal to the number of morphisms from the abelian group to . But this number turns out to be because the number of morphisms from a finite abelian group to is precisely ; we leave this statement as an exercise (hint: argue by induction on the number of factors in the decomposition of as a direct sum of cyclic groups). Theorem 1: Let be the fundamental group of a closed surface and be a subgroup. Either has finite index in and is isomorphic to the fundamental group of a closed surface whose Euler characteristic is , or is an infinite-index subgroup of and is free. For this note, I was inspired by Jaco’s article, On certain subgroups of the fundamental group of a closed surface. The proof of property 2 below comes from Stillwell’s book, Classical topology and combinatorial group theory. Property 2: The fundamental group of a non-compact surface is free. Combined with Property 3, let us first notice some corollaries of Theorem 1 on the structure of surface groups. Property 3: The abelianization of (resp. ) is isomorphic to (resp. ). Therefore, two closed surfaces and are homeomorphic if and only if their fundamental groups are isomorphic. Consequently, the and define a family of pairwise non-isomorphic groups, and the conclusion follows from the classication of closed surfaces. Corollary 1: Let be the fundamental group of a closed surface different from the projective space. Then is torsion-free. Proof. The abelianization of a surface group is cyclic if and only if it is the fundamental group of the projective plane; therefore, the same conclusion holds for the surface groups themself, and we deduce that has no cyclic subgroup of finite index. Consequently, the cyclic subgroup generated by a non trivial element of is free, that its order is infinite. Corollary 2: Let be the fundamental group of a closed surface satisfying and be a subgroup generated by elements. If then is free. Proof. If , is a torus or a Klein bottle, and the statement just says that its fundamental group is torsion-free, that follows from Corollary 1. Corollary 3: Let be the fundamental group of a closed surface satisfying . If commute, then there exist and such that and . Therefore, the groups and are not abelian for , and we deduce that the sphere, the projective plane and the torus are the only closed surfaces whose fundamental group is abelian. Because satisfies , we conclude that has no finite-index abelian subgroup, and that the subgroup genereted by is necessarily free; since and commute, the subgroup turns out to be cyclic and the conclusion follows. Corollary 4: The commutator subgroup of a surface group is free. Proof. Let be the fundamental group of a closed surface . If is a projective space, then and its commutator subgroup is trivial (in particular free). Otherwise, thanks to Property 3 we know that the abelianization of is infinite; therefore, the commutator subgroup is an infinite-index subgroup and so is free. Proof of property 2. First, we notice that the fundamental group of a connected compact surface with boundary is free. If is such a surface, by gluing a disk along each boundary component, we get a closed surface ; therefore, is homotopic to a punctured closed surface. Because a closed surface may be identified with a polygon whose edges are pairwise identified, it is not difficult to prove that a punctured closed surface is homotopic to a graph (by “enlarging the holes”); in particular, we deduce that is free. such that and that the inclusions are -injective. It is sufficient to conclude since we proved above that the fundamental group of a compact surface with boundary is free. 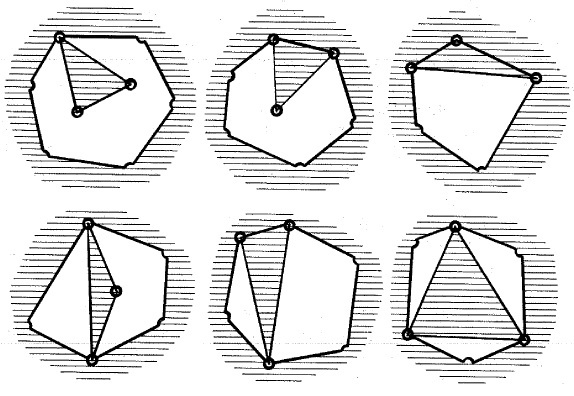 Take a triangulation of so that may be identified with a simplicial complex; let denote the 2-simplexes. Without loss of generality, we may suppose that is adjacent to one of the simplexes ; otherwise, number the simplexes by taking first the simplexes adjacent to a vertex cyclically, then the simplexes within from , then the simplexes within from , etc. Let . Now suppose that is given. If , then set ; otherwise, define as the union of with and with the disks bounding a boundary component of . Because is a union of , we know that it is a compact surface with boundary. To conclude, it is sufficent to prove that the inclusion is -injective. To do that, just notice that is attatched on the boundary of in six possible ways: In the first three cases, because the boundary component bounds a disk in if and only if it bounds a disk in . So clearly retracts on so that the inclusion induces an isomorphism . In the three last cases, up to homotopy, we just glue one or two edges on a boundary component, and using van Kampen’s theorem, we notice that a free basis of is obtained by adding one or two elements to a free basis of . Proof of theorem 1. Let be the covering associated to the subgroup ; in particular, is a surface of fundamental group . If is a finite-index subgroup, is compact and the conclusion follows. Otherwise, is not compact, and the conclusion follows from Property 2. In the note Some SQ-universal groups, we prove also that almost all surface groups are SQ-universal. In particular, it implies that they have uncountably many norma subgroups. This note is dedicated to Freudenthal compactification, a kind of compactification for some topological spaces. In particular, it will be noticed how such a compactification leads to the number of ends, a nice topological invariant, and how it can be used to classify compactifications with finitely many points at infinity. The proof of theorem 1 is mainly based on Baues and Quintero’s book, Infinite homotopy theory. First of all, we introduce the spaces we will work with. Definition: A generalized continuum is a locally compact, connected, locally connected, -compact, Hausdorff topological space. Typically, a generalized continuum may be think of as a locally finite CW complex or as a topological manifold. Let be a generalized continuum. Because is -compact, it is an increasing union of compact subspaces ; moreover, by locally compactness, we may suppose that for all . Such a family of compact subspaces is called an exhausting sequence. Definition: Let be a generalized continuum and be an exhausting sequence. An end is a decreasing family of subspaces such that is an unbounded (ie. not relatively compact) connected component of . Let denote the set of ends of and . If is an end and is an open subspace, will mean that for some . Clearly, the restriction of a function to the family we fixed to construct defines an end of , so there exists a natural continuous map . Conversely, an end naturally corresponds to a function of : if is compact, there exists some such that , and may be defined as the unbounded connected component of containing . Therefore, the map turns out to be a homeomorphism. In particular, does not depend on the sequence since neither does . Theorem 1: Let be a generalized continuum. Then is a compactification of , that is is a(n) (open) dense subset of and is compact. We will prove the theorem only at the end of this note. Before that, we will mention two nice consequences of our construction. The first one is that Freudenthal compactification gives a topological invariant: the number of ends, . Theorem 2: Let be two generalized continua. If is a homeomorphism, then extends to a homeomorphism ; in particular, induces a homeomorphism . Proof. Let be an exhausting sequence for . Then is an exhausting sequence for . Moreover, if is an end of then is naturally an end of : it defines our extension . We easily check that is a homeomorphism. Corollary: The number of ends is a topological invariant. Property: Let and , be two finite subsets. If then and are not homeomorphic. Proof. Just notice that and similarly . Our second consequence of Freudenthal compactification is the classification of all possible compactifications whose remainders are finite (the remainder of a compactification of a space is ; sometimes, the points of the remainder are also called points at infinity). Theorem 3: Let be a generalized continuum and be a compactification of whose remainder is finite. Then is obtained from by identifying some ends. 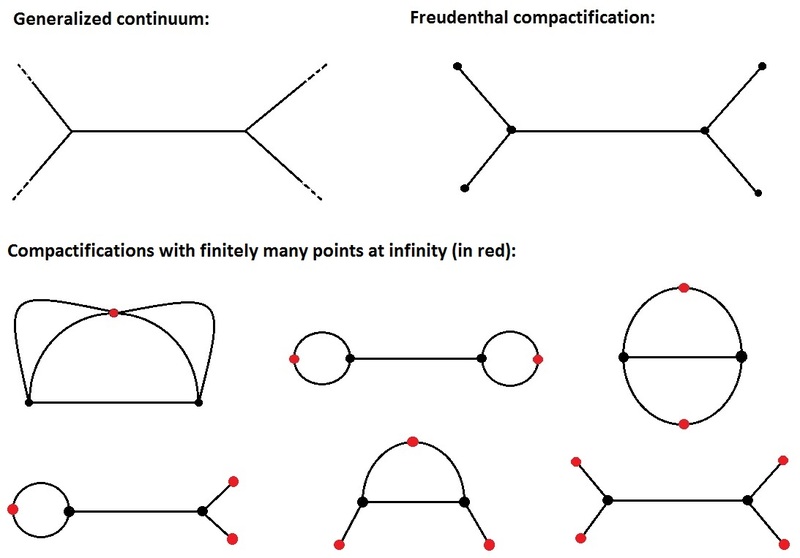 Therefore, Freudenthal compactification can be viewed as a maximal compactification among compactifications with finitely many points at infinity. notice that is compact. For all , let be a connected neighborhood of disjoint from ; again, we may suppose that if . Because is connected, there exists such that ; moreover, because if , such a is unique. Therefore, a map may be defined by and . is open in since if and only if , we deduce that is continuous. Moreover, is onto. Let denote the space obtained from by identifying two ends and whenever . By construction, is well-defined and into. Then, is continuous since is open, and onto since is onto. Finally, is a continuous bijection between two compact spaces: it is necessarily a homeomorphism. Corollary 1: Let be a generalized continuum. Then has only one compactification with one point at infinity: its Alexandroff compactification. Corollary 2: Let be a generalized continuum and be a compactification of whose remainder is finite. Then . Theorem: Let be Peano space. Then there exists a compactification of whose remainder is homeomorphic to . For example, if denotes the graph of the function , then is homeomorphic to , and is a compactification of whose remainder is homeomorphic to . See also B. Simon’s article Some pictoral compactification of the real line to find a compactification of whose remainder is homeomorphic to the torus . From now on, we turn to the proof of theorem 1. Lemma: Let be a generalized continuum. Then is a compact subspace of . Proof of Theorem 1: Fistly, the injection is clearly a homeomorphism onto its image; therefore, from now on, will be confunded with its image in . Then is clearly dense in , so to conclude the proof, we only need to prove that is compact. Let be an open covering of . Because is compact, there exists finite such that for all , there exist and an unbounded connected component of such that . If , then is a finite subcovering of the unbounded connected components of . Notice that implies that , so a connected component of intersects or is included in . But is compact, so there are only finitely many components of intersecting . Therefore, if denotes the union of with the closure of the bounded components of intersecting , then is compact. In particular, there exists finite such that is a finite subcovering of . Finally, we deduce that is a finite subcovering of . Hence is compact. But is obviously continuous, is continuous by definition and is Hausdorff, so is closed. We conclude that is closed, and finally compact. Algebraic topology gives a strong link between graphs and free groups. Namely, the fundamental group of a graph is a free group, and conversely, any free group is the fundamental group of a graph. Surprisingly, using the framework of graphs and coverings gives a lot of information about free groups. Our aim here is to exhib some purely algebraic results about free groups and to prove them using graphs. Our main references are Massey’s book, Algebraic Topology. An Introduction, Hatcher’s book, Algebraic Topology, and Stallings’ article, Topology of finite graphs. 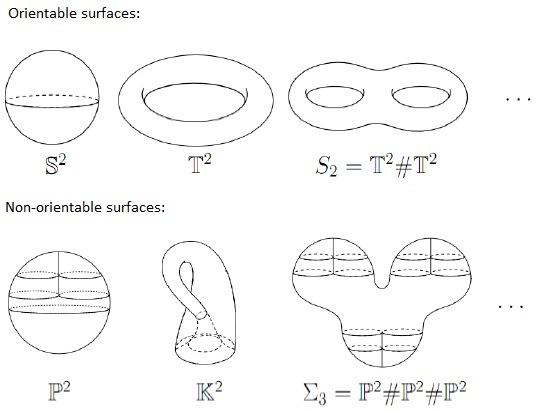 We refer to these references for the results of algebraic topology we use below. Theorem 0: The fundamental group of a graph is free. Conversely, a free group is the fundamental group of a graph. Proof. Let be a graph. If is a maximal subtree, then is a bouquet of circles and . The universal covering of is a regular tree of degree , so it is also the usual Cayley graph of the free group of rank . Because a group acts freely on its Cayley graph, we deduce that . Conversely, let be a free group of rank . With the same argument, is the fundamental group of a bouquet of circles. Notice that in the first part of the proof, is the cardinal of edges of not in . In particular, the fundamental group of a finite graph is a free group of finite rank. Proof. We view as the fundamental group of a graph . Let be a covering satisfying . In particular, the covering induces a structure of graph on making the covering cellular; in particular, is a free group. in the same way, . Therefore, . Theorem 2: A non-abelian free group contains a free group of infinite rank. We already proved theorem 2 using covering spaces in the previous note A free group contains a free group of any rank. We know from theorem 1 that any finite-index subgroup of a finitely generated free group is finitely generated. Of course, the converse is false in general: is a finitely-generated subgroup of infinite index in . However, the converse turns out to be true for normal subgroups. Theorem 3: Let be a free group of finite rank and be a non-trivial normal subgroup. Then is finitely generated if and only if it is a finite-index subgroup. Proof. Suppose that is an infinite-index subgroup. Let be a bouquet of circles so that be the fundamental group of and let be a covering such that is the fundamental group of the graph . Noticing that a deck transformation associated to the covering is a graph automorphism of , we deduce that the group of graph automorphisms is vertex-transitive since the covering is normal. Let be a maximal subtree. Because is non-trivial, there exists a cycle in . Moreover, because is an infinite-index subgroup the graph is infinite and there exist vertices of satisfying and for all ; let be a graph automorphism sending to . Then is a family of disjoint cycles, so there exist infinitely-many edges of not in . Therefore, is not finitely generated. Theorem 4: A free group of finite rank is subgroup separable. In particular, it is residually finite and Hopfian (ie. every epimorphism is an isomorphism). Theorem 5: (Hall) Let be a free group of finite rank and be a finitely generated subgroup. Then is a free factor in a finite-index subgroup of . Proof. Let be a bouquet of circles so that and let be a covering so that . If is a maximal subtree, because is finitely generated by assumption, there exist only finitely-many edges of not in ; let be a finite connected graph containing these edges and such that is a maximal subtree of . Let denote the canonical completion . Now a finite-index subgroup of and is a free basis. By construction, this basis contain a free basis of , so is a free factor in . Theorem 6: (Howson) Let and be two finitely-genereated subgroups of a free group . Then is finitely-generated. It is precisely the content of the note Fiber product of graphs and Howson’s theorem for free groups. We conclude with an application holding not only for free groups of finite rank but for any finitely generated group! The clue is that any group is the quotient of a free group. Theorem 7: A finitely generated group has finitely many subgroups of a given finite index. Proof. Let be a free group of finite rank and . Clearly, a finite graph has finitely many -sheeted covering (because such a covering is a graph with a fixed number of vertices and edges), so has finitely many conjugacy classes of groups of index ; moreover, a finite-index subgroup’s conjugacy class is necessarily finite (if a subgroup has index , then implies ). Therefore, theorem 7 holds for finitely generated free groups. Let be a finitely generated group. Then is the quotient of a free group, that is there exists an epimorphism onto a free group of finite rank. Then, for all , defines an injective map from to set of -index subgroup of into the set of -index subgroup of . The theorem 7 follows.